Vasyl Lomachenko’s frustration is admirable. The man wants real challenges, not gimmies like Anthony Crolla. And he has difficulty hiding his feelings. I was at a press conference a few days before he fought Miguel Marriaga on August 5, 2017. 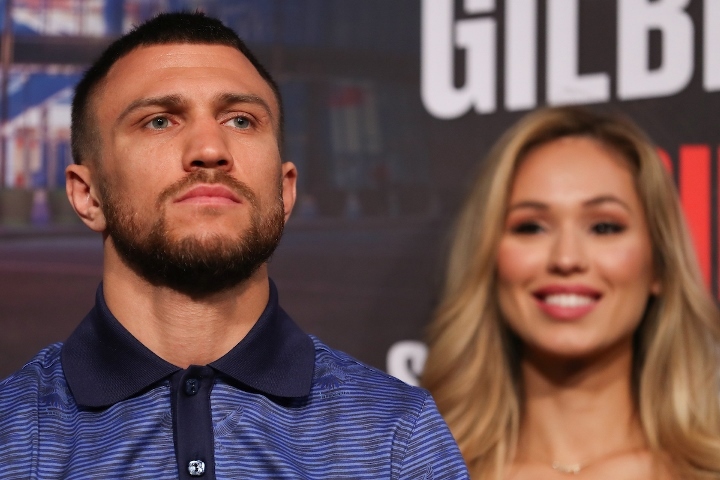 Lomachenko had hoped to face rugged veteran Orlando Salido – the only man to beat him – in a rematch on that date but the fight didn’t materialize, which allowed the limited Colombian to step in. Marriaga, who was stopped in seven rounds in a horrible mismatch, was Lomachenko’s second consecutive pushover. He had stopped Jason Sosa in his previous fight. “I’m frustrated, of course,” Lomachenko told me at the pre-fight press conference. The WBA and WBO lightweight titleholder had expected to face IBF champ Richard Commey in a title-unification bout around this time but Commey couldn’t fight because of an injured hand, opening the door for Crolla to face Lomachenko on Friday at Staples Center in Los Angeles. The Englishman is Lomachenko’s WBA mandatory challenger and a solid fighter but not exactly what the No. 1 or 2 fighter in the world has in mind. "Of course, I don't like it,” he told ESPN.com. “It's not good for me, but it is what it is." Of course, Lomachenko (12-1, 9 knockouts) has had a number of fights that inspired him. He famously fought – and lost to – the overweight Salido for the vacant WBO featherweight title in his second professional fight, with the belt on the line only for Lomachenko. That was a real challenge. Lomachenko fought gifted American Gary Russell Jr. for the same vacant title in his subsequent fight and won impressively. He later stopped Roman Martinez to win a junior lightweight belt and followed with a sensational stoppage of then-hot Nicholas Walters. And, finally, in back to back fights, he successfully defended his 130-pound title against then-unbeaten Guillermo Rigondeaux and outpointed Jorge Linares for a 135-pound title. That means Lomachenko has faced what he would consider meaningful challenges in roughly half of his professional fights, which is beyond reasonable at a time when a lack of credible opponents and boxing politics make it difficult to put together compelling matchups. Still, fights like the one this Friday fail to light a fire under Lomachenko. And it could get worse. Who does he fight going forward? A tussle with Commey arguably is worthwhile because it would unify three 135-pound titles, which is attractive to Lomachenko. Let’s be realistic, though. Commey is fun to watch because of his power but he lost his two toughest fights, against Robert Easter Jr. and Denis Shafikov. Commey is good but is he really a threat to Lomachenko? One of the best possible matchups in boxing is Lomachenko vs. Gervonta Davis and Lomachenko has said more than once that he wants that fight, even offering (in jest) to fight without pay and go down to Davis’ weight of 130 pounds. Unfortunately, that fight almost certainly won’t happen because of politics: Lomachenko is promoted by Bob Arum, the unbeaten Davis by Floyd Mayweather. Arum, perhaps trying to steer the conversation away from Mayweather’s fighter, said Lomachenko vs. Davis wouldn’t generate as much money as matchups with fellow pound-for-pounder Mikey Garcia or rising knockout artist Teofimo Lopez, the latter of whom is also promoted by Arum. Lomachenko said he’d love to fight Garcia but only at 135 pounds. That could be difficult for Garcia, who still holds the WBC lightweight title but went up to 147 for his disastrous challenge of Errol Spence. I doubt he can come back down to 135 comfortably after bulking up; at least, it might be wise. Plus, Garcia seems leery about doing business with his former promoter – Arum – after a less-than-amicable breakup. Lopez is a realistic opponent for Lomachenko but not any time soon. “Down the road,” Arum said, “there’s Teofimo Lopez.” Down the road could be years. Lopez is only 21 and a potential star. Arum presumably wants to build him into a major attraction, not have him get knocked off by a boxing wizard. Who else resides around 135 pounds? At 130, there are titleholders Miguel Berchelt, Tevin Farmer and Masayuki Ito, along with a few other notable fighter who might be willing to move up in weight. Nothing exciting there. At 135, there isn’t much either. And, at 140, there are Jose Ramirez (promoted by Arum) and Regis Prograis but those are two more “down the road” fights for Lomachenko, who has fought only twice at 135 pounds. That could mean that all Lomachenko has in his immediate future is Commey and more frustration. I hope I’m wrong. Arum and his matchmakers have done a good job of finding compelling opponents for their star. Perhaps they can use their creativity and clout to come up with someone who will make Lomachenko and the fans happy. I just don’t see where they’ll find him. Michael Rosenthal was the 2018 winner of the Boxing Writers Association of America’s Nat Fleischer Award for excellence in boxing journalism. He has covered boxing in Los Angeles and beyond for almost three decades.